LoopLink has had some pretty major updates committed over the weekend. We have added a host of new features that our users have been asking for and we also added some things you didn't know you wanted but won't know how you lived without. Most of the readers of this blog probably got an email from us with a quick run down of what we added/changed but here we'll go a little deeper and explain more about each feature. Dual fuel systems are popular in areas with extreme cold. Especially when electric utilities offer special discounts for those who will heat their homes with a secondary back up system during peak demand periods on really cold days. The way we have approached it, you can choose either how many hours in a year the dual fuel system will run or at what temperature it will kick in. The dual fuel system is modeled as a standalone system capable of supplying the necessary capacity for an entire zone (yep... its zone by zone so you have a lot of control over implementation). You also have the flexibility to choose whether the dual fuel system replaces the electric back-up or if the system is used in conjunction with a supplemental electric resistance heater. The graph shows, bin hours overlaid with load lines and operating lines so that you can quickly see the cut off points for dual capacity equipment. 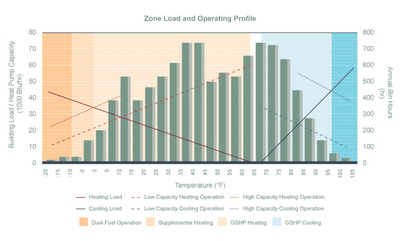 Included in the design report, this graph allows you to very easily point out to a home/building owner how the heating and cooling loads are split up into hours of operation in high capacity, low capacity and in the case of heating mode, when supplemental resistance heat will turn on and when the geo system will will switch over to dual fuel operation. There are several manufacturers out there that make water-air systems that can be controlled to offer hot water generation priority. In other words, when you need more hot water, the system stops heating the house and only heats water until your need is satisfied. LoopLink now offers the option to include this equipment in your designs. The option is only available on a few heat pumps so if you aren't designing with those heatpumps installed in a zone, you may never see this option. We have generally cleaned up the options available for domestic hot water generation. The list of choices has been simplified and relabeled to clear things up a bit. The options available in your list are dependent on the heat pumps selected for your zones but will consist of: Desuperheater, On Demand and Water-Water with space priority. Energy prices used to be the last required fields to fill out on the project details page and energy price inflation rates were defined on the operating cost summary page. We have taken the two and created a separate page out of them for two reasons. Users that wanted to do quick sizing estimates were annoyed with forced economic inputs. We added the ability to handle seasonally adjusted rates. For the users that want to do quick estimates and aren't worried about the econ side of things we have made your life as easy as possible. You will need to define energy costs once... in one project (any project) and click the new "STORE DEFAULTS" link. When you do this, we store the values you entered and use them on every new project you create. You have the freedom to change the values of course but now you won't have to define costs every time you create a project. The seasonally adjusted rates option wasn't argued for as loudly as some of the other features we built in this time around, but it is pretty slick for those that have the option in their area. If you don't know about these, check with your utility company. A seasonally adjusted rate gives discounts on energy prices in the off season for an area. For example, in Texas where they have HOT summers but reasonably mild winters... winter electricity may be cheaper because demand is so much lower than in the summer. Long story short, if you have rate adjustments available to you, we now support them which improves the cost of ownership comparison for geo pretty significantly in some cases. This version of LoopLink marks the first time we are offering a monthly account option. The monthly account is a great option for those that aren't designing systems for the entire year. Say you only work on design for two or three months a year... now you can just jump in and pay $50.00 for the one month access and save yourself a little money. For all accounts we have made some improvements to our account settings section and have given you more control over your account options. Perhaps the least noticeable improvements made to the site are the ones that have the biggest impact on your user experience. You'll notice straight away that the colors of the site have changed but we also made some structural changes behind the scenes that will make this version of LoopLink, faster and more consistent in browsers like IE8. There are fewer images passed to your computer, calculation methods have been optimized and wherever possible we have simplified the code to shave time off our responses so you wait less for your answers.